It is a bit ironic that my previous post was entitled "Playing Defense"- which I certainly feel like I am doing as the gales blow through here every two days- but unfortunately last night I did not play very good defense, and a sail was damaged as a result. I prepared for the night by getting 2 reefs in the mainsail and the Solent jib out, planning to "run deep", or run before the wind at a True Wind Angle (TWA) of about 145'. I had experienced good results with this sail plan previously in winds up to the low 30's. However, last night as the night wore on, the winds just continued to rise until they were consistently in the low to mid 40's- a lot of wind. The sea state came up quickly and the boat started getting thrown around. I kept ticking down the auto pilot control button to have the boat sail more downwind, but at a certain point the boat begins to wallow in the wave troughs, and the jib is blanketed by the main and begins to flail around wildly as the wind fills it with a crack and then empties. Listening to this happen from below in the cabin at 3:00AM, I felt I had to furl the Solent or the sail would get damaged from all of the shock loading. So, despite considerable trepidation, I geared up and went out into the maelstrom. The sea was lit, as the phosphorescent foam of the breaking waves was illuminated by a full moon. I released the Solent jib sheet and went forward to furl the sail using the furling drum at the bow. However, the wind was so strong that the sheets were flying all over the place, and I was wacked in the nose (a bit of blood) and then my headlamp was knocked off by the flailing sheet. I sat down on the deck and pulled as hard as I could on the furling line, but it barely moved. The sail was all over the place and ended up getting wrapped around the headstay, so I returned to the cockpit to tend to the sheets and see if I could get it unsnarled. I eventually did, but a small tear developed in the foot of the sail just forward of the clew patch (where the sheets attach to the sail). With the sail continuing to fill and empty, the tear quickly grew horizontally, moving down the foot of the sail (see photo below). At this point I knew I was screwed, as I could not get the sail furled and we were clearly over-powered by the 40+ knot wind- and it was scary. As I sheeted the sail in, the boat would round up, causing it to get sideways to the waves and lose steerage. It was not fun. A rogue wave hit from a weird direction- kicking the stern around- and we accidentally jibed. Big mess- boat heeled radically- Release jib- release running backstays- release traveler- get the boat moving- violently gybe back to original course. I knew than I had to get the Solent furled, so just went forward with considerable adrenaline pumping- not taking no for an answer- and just muscled it in- although it was a bit shredded at this point along the foot. We were then back under control with just the main with 2 reefs and I went below to lick my wounds. So- I am very disappointed that I allowed myself to get in that situation. The challenge is to always have just the right amount of sail up- not too little so you go slowly and not too much so you are out of control with a rapid wind increase. 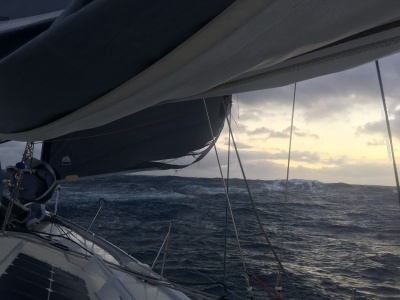 I guess the truth is that I really did not expect it to blow a sustained 45k with that really nasty sea state, or I would have had much less sail up. The harsh reality is that you have to reduce sail before the gale- because once you are in it, it is very difficult to get sails down. So tonight another gale is coming- so I will have three reefs and the staysail- and hope that will be the right combination to maintain steerage without being over-powered. The solent jib- my primary jib- is at a minimum temporarily out of commission and may be permanently toast- that remains to be seen- but either way- a costly mistake. So I will discuss a possible repair of the Solent jib with my sailmaker and see what we can come up with. The Solent is not on a halyard to raise and lower, as it is permanently lashed in place to the mast, so I would need to go up the mast to get it down to work on- which could only happen in very calm conditions, i.e. not down here- so I will be without it in the short term. This will likely slow me down a bit- but there is not much I can do about that at this point. In the meantime I am hunkered down- trying to play better defense- and looking forward to getting around the Horn- out of the Southern Ocean and back into the Atlantic Ocean- within two weeks- or about 2,800 miles straightline. But it could be a long two weeks.